The Grizzlies are the champions again. 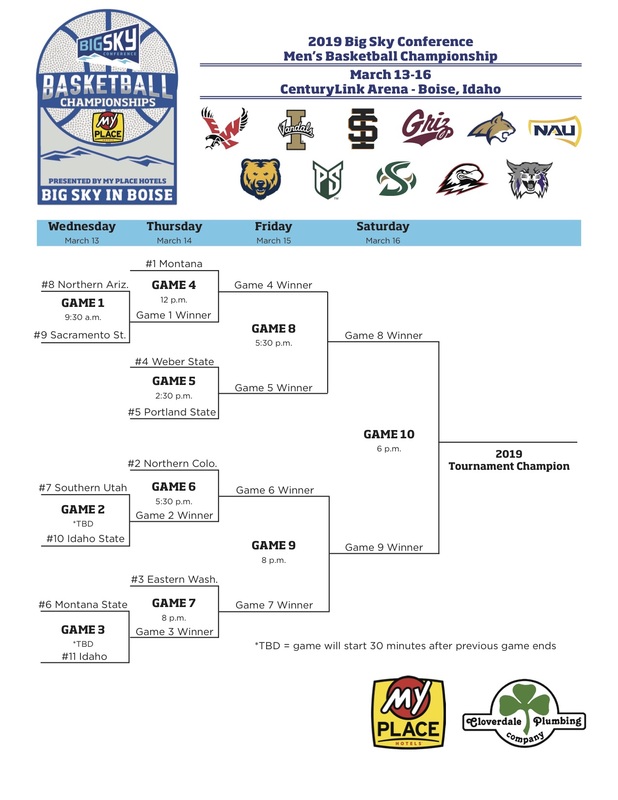 And Montana State will have to play in the first round of the Big Sky Conference Tournament next week in Boise (see bracket below). 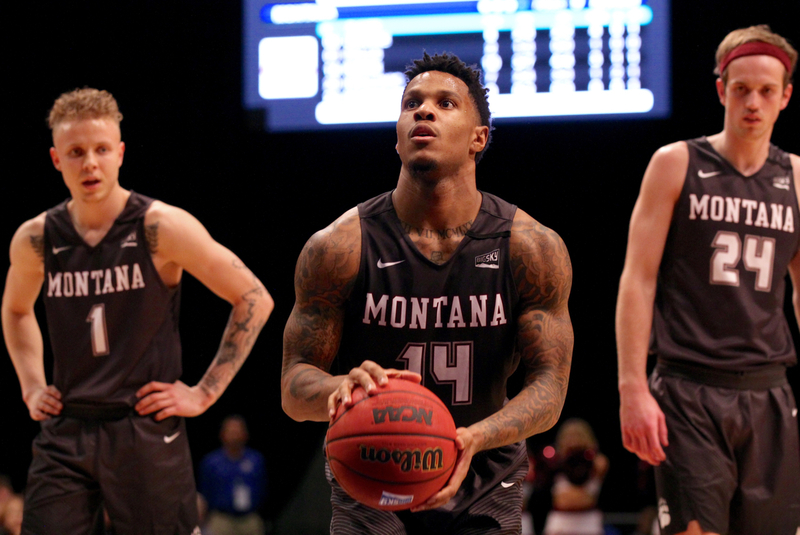 Montana put together a thorough, balanced and dominant effort, allowing 18 points in the final 16 minutes to take a one-point deficit and turn it into an 86-68 victory over Sacramento State at the Nest on Saturday night. The win means the Griz repeat as outright Big Sky regular-season champions. It’s the 5th league title in the last eight seasons, including the third under fifth-year head coach Travis DeCuire. UM takes the top seed into the conference tournament next week looking for a second straight trip to the Big Dance. The banner is the 11th in school history thanks to a 16-4 record during the first 20-game schedule in league history. UM sewed up the No. 1 seed before the game began. Northern Arizona shocked the Bears on league MVP favorite Jordan Davis’ senior night, emerging with an 89-78 overtime win. The Bears will take the No. 2 seed into the tournament. Montana State entered its current road trip needing a win to secure a first-round bye. Despite 34 points against Sacramento State and 28 more from Tyler Hall on Saturday night, Portland State continued its surge. A second straight hot shooting night by reserve guard Deante Stickland lifted the hosts to an 84-80 victory. The win secures the No. 5 seed in the conference tournament and the bye that comes with it. The Vikings, winners of seven of their last eight, will play Weber State in the quarterfinals of the tournament beginning on Thursday. Eastern Washington sewed up the third seed by stealing a win at Weber Saturday night. Mason Peatling poured in 23 points, Jesse Hunt posted a 22-point, 11-rebound double-double and Kim Aiken scored 20 points to lead EWU to an 80-77 victory. Weber State is the No. 4 seed. The Wildcats lost eight of 12 down the stretch, including four of five the last few weeks. WSU won 95-88 in overtime at PSU. Portland State and Weber play Thursday at 2:30 p.m. The Griz play the winner of No. 8 Northern Arizona and No. 9 Sacramento State, the first game of the men’s tournament. NAU and Sac tip at 9:30 a.m. on Wednesday. UNC plays the winner of No. 7 Southern Utah and No. 10 Idaho State. EWU plays the winner of Montana State and Idaho. The Bobcats and the Vandals play at a to be determined time, according to a bracket posted by the league. Over the span of six and a half minutes, Montana executed a methodical 12-0 run to put the Hornets at arm’s length. Marcus Graves halted the run briefly, only two see five straight from Kendal Manuel and Timmy Falls. Falls, a sophomore from Dublin, California, made his first start since November and his fourth this season about 90 minutes from his hometown. Falls made the most of it, controlling the game for portions of the action. He finished with a season-high 16 points and notched five assists, his second-highest total this season. 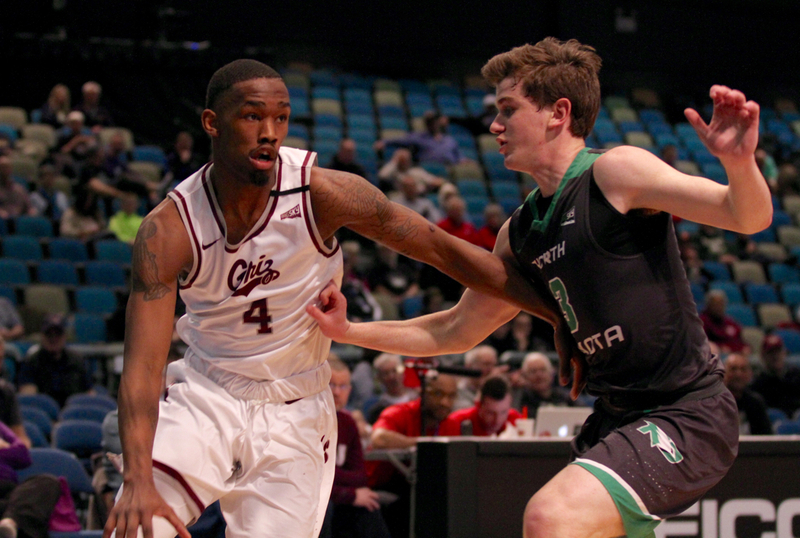 Michael Oguine took yet another hard fall Saturday but the energetic Griz senior kept coming. He scored the first five points of the game as UM opened the action on a 12-2 run. The Los Angeles native also finished with 16. Sayeed Pridgett converted all four of his shots in the first ahlf and finished 7-of-12 overall on his way to a team-high 17 points in just 24 minutes. Manuel hit three of UM’s 10 3-pointers on a night the Griz notched 22 assists. And Ahmaad Rorie dished out five of those assists to go with 11 points on a steady 11-point outing. The Griz shot 59.6 percent from the floor and 45.5 percent from deep. UM entered the game shooting 68 percent from the free throw line as a team. Motnana hit 14-of-16 from the stripe. Sac State senior center Josh Patton dominated the paint, catching a variety of backside alley-oops on his way to 14 first-half points. He finished with a team-high 20. Graves added 15, although his shooting struggles continued. One game after shooting 1-of-7 from deep against Montana State, Graves was 1-of-5 from beyond the arc. Patton scored 34 points and grabbed 11 rebounds in Sac’s 66-64 win at Northern Arizona in January. 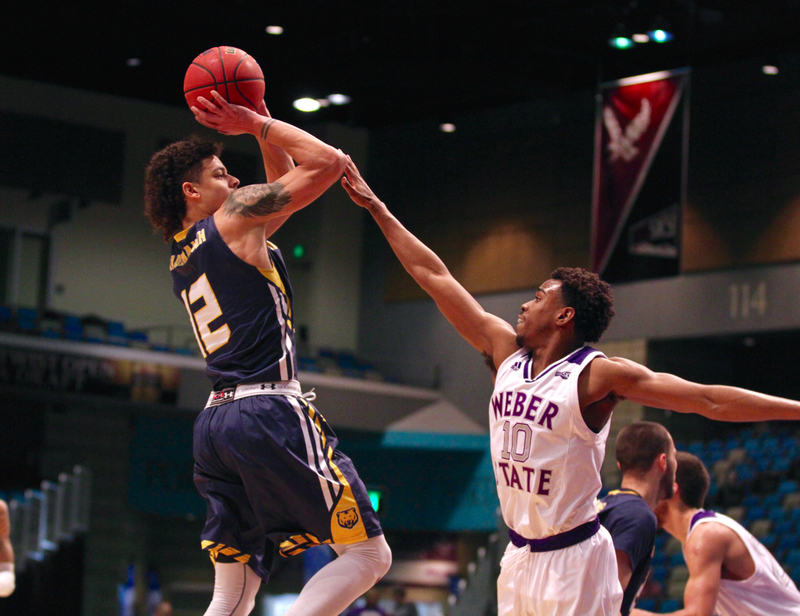 Behind 17 points and 10 assists from Carlos Hines, NAU won 78-66 in Sacramento. The winner of that game takes on Montana at noon on Thursday. Hall carried the Bobcats in the second half. His second triple after halftime and his fourth overall gave Montana State a 64-61 lead, its first after trailing by as many as 11 points with seven minutes to play in the first half. Hall then went to work in the paint, converting on four different difficult shots on a night he went 12-of-20 from the floor. Junior Harald Frey missed six of his eight shots from deep yet still finished with 27 points, thanks in part to a 9-of-10 night at the charity stripe. But Strickland, who scored 19 points and hit four 3-pointers in PSU’s 81-69 win over Montana Thursday, hit five 3s on Saturday, again finishing with 19 points. The Vikings hit 13 triples but it took them 38 attempts. Michael Nuga came off the bench to score 15 while Holland Woods and Robert McCoy each had 12 points for the Vikings. Brooks Nuanez, Director of Operations — Brooks is the co-founder, senior photographer and Director of Operations for Skyline Sports. He is a life-long athlete who enjoys the fierce nature of sports as much as he enjoys the sweet harmony of music. Brooks first gained an interest for photography at a young age, and grew that passion into a craft. Brooks has spent most of his life in Montana, instilling a love for the mountains and the wildlife. The University of Montana alum spent parts of three seasons as a safety for the Grizzly football team while earning a degree in business management, honing his passion for craft beer, people and his entrepreneurial spirit. In July of 2015, Brooks married his lifelong love, Kaila. The couple lives happily in Bozeman with their son Ellis.Brooks can be reached at Brooks.nuanez@gmail.com and followed on Twitter @Brooksnuanez and @SkylineSportsMT.